It is commonly known that sugary and acidic foods can lead to weakened tooth enamel and an increased risk of tooth decay. While some choices may seem apparent, there are some not so obvious food choices that can harm your teeth as well. When avoiding soda, juice is not necessarily a good alternative. Juice is typically high in sugar. Even the sugar-free varieties can harm teeth due to natural fruit sugars. Juice can be a healthy drink option in moderation. Sticky, sugary sweets can cling to the teeth, giving bacteria a chance to grow and harm teeth and gums. Hard candy remains in contact with teeth for longer periods of time. Limit these sweets to reduce potential damage to teeth. High carbohydrate foods contain starch and natural sugars. While carbs are necessary for good health, be sure to brush your teeth after indulging. Lemons are good for you but are highly acidic. Eating lemons can erode tooth enamel. Instead, make homemade lemonade without sugar, or soak sliced lemons overnight in a pitcher of water in the refrigerator to enjoy the flavor without the straight acid. Cough drops. lozenges, and syrups contain concentrated sugars. Be sure to brush or increase water intake, which can also help your cough. 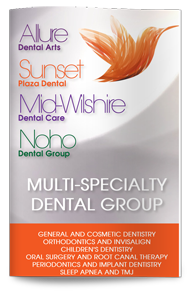 If you have more questions about how your food and beverage choices can affect your teeth, make an appointment to see our West Hollywood dentist for an exam and recommendations that are based on your individual circumstances.